Sun-North Systems Ltd - Why Use Insulation in a Barn? Each type of livestock and poultry has their own temperature preference range for optimum comfort. Temperatures above or below this preferred range causes unnecessary and preventable stress. The ventilation system controller is used to set and maintain optimum air temperature and exchange to ensure consistent and optimum air quality. Condensation occurs on interior barn surfaces when the surface reaches the dew point temperature of the air inside. This often occurs in winter seasons when the interior surfaces are often cooler than the air due to outside air temperature influence. Dew point is a factor of humidity and temperature at a set temperature, the higher the humidity the higher the dew point. If you are able to control the humidity level by adequate ventilation you can reduce the occurrence of condensation. 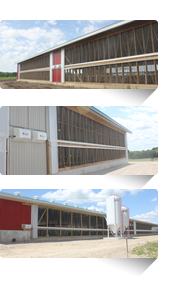 Livestock and poultry buildings require proper insulation and ventilation to prevent interior condensation caused by the animals continuous respiration of moisture into the space. The ability of air to hold moisture is directly related to its temperature. As air cools, its ability to retain moisture is reduced. Dew point temperature is the temperature at which water vapour begins to condense out of the air. Maintaining a building temperature above dew point is necessary to prevent water from condensing into a liquid state. The ventilation system is no longer able to properly exhaust the moisture from the building without revaporization once the liquid state is reached. This excess moisture causes poor air quality and is trapped within the space. All ventilation systems operate on the principle of heat balance. In warmer seasons, the temperature of a building will rise exponentially if not adequately ventilated and insulated. This heat rise is caused by outdoor climate conditions and heat produced by the animals. In colder seasons, heat balance is required to offset the heat loss from the building caused by outer climate conditions as well as the heat produced by the animals. 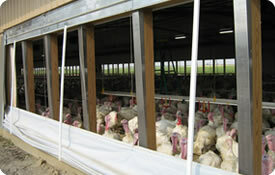 Heat balance is required to maintain the livestock and poultry's optimum comfort level.